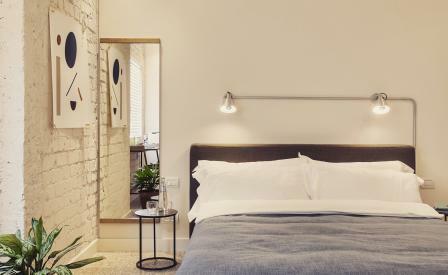 A former office building from the 1940s has been reinvented as Hotel Saul, a thoroughly modern addition to Tel Aviv’s boutique hotel scene. Named after the great Hebrew poet Shaul Tchernichovsky, this 34-room-bolthole chronicles the city’s compact but colourful history. The ornamental grandeur of the art deco period is alluded to with brass tiles; further nostalgia is incorporated with restored street lamps, vintage balcony railings, and wood panelling. Yet don’t be fooled into thinking this is a heritage-style property. Architect Dan Troyim has catered to design-conscious urbanites with a decidedly contemporary interior that contrasts whitewashed brick walls and exposed concrete against the sleek lines of walnut furniture. While the pared back furnishings are pure bachelor pad, homely splashes of colour are added by framed geometric prints, the verdant leaves of a potted plant, and the smoky blue of handwoven Turkish linen. Hotel Saul takes its commitment to millennial creature comforts seriously. Swing by the Barvazi cafe in the lobby for gourmet sandwiches with home-smoked meats and cheeses, or head to the fourth floor for board games. Should a ‘Netflix and chill’ night be in order, there’s an in-room account, plus Nintendo and Playstation games. Peckish? They’ll even deliver a bucket of popcorn to your door.